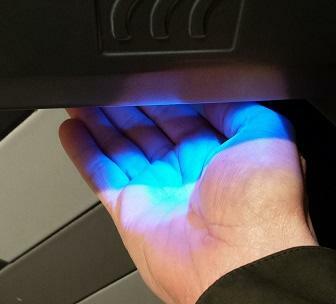 The UVC Hand dryer has just the answer; as with many hospital operating theatres, it uses a powerful UVC light source to kill bacteria and viruses from the air that dries the hands, preventing their spread. Is there any truth to that theory? It seems to me that neither the intensity nor the duration of exposure would be enough to make a real difference. Yamamoto Y, Ugai K, Takahashi Y. Efficiency of hand drying for removing bacteria from washed hands: comparison of paper towel drying with warm air drying. Infect Control Hosp Epidemiol. 2005;26(3):316–20. Log colony-forming units (CFU) on palms and fingers increased significantly when hands were dried with warm air while being rubbed for 15 seconds (P < .001), and many bacteria remained at 30 seconds without ultraviolet light (P < .001) [...] Few CFU were detected on palms and fingers dried with ultraviolet light. [...] Ultraviolet light reinforced the removal of bacteria during warm air drying. the evidence for whether any particular method of hand drying is more effective than another, is conflicting/level 4. So, the first paper provides some evidence that UV lights on dryers help, but there are reasons to wait for more conclusive evidence. Not the answer you're looking for? Browse other questions tagged biology hygiene public-health . Is it possible to crush bacteria? Does alcohol-free “essential oil” mouthwash kill bacteria in your mouth? Does Coca-Cola kill germs in the stomach? Can an air-bubble in a syringe kill the patient? Do handwashs kill 99.9% of bacteria?